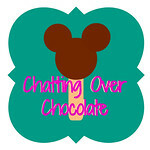 Chatting Over Chocolate: Happy Friday! Hello, friends! It's been an extremely busy week here, so much so that I haven't had a moment to whip up a post for today! However, I didn't want that to stop me from wishing you all a lovely Friday and a fabulous upcoming weekend! Enjoy, enjoy, sweet friends! Have a great weekend, Brenda!